I had high aspirations with this beer. From my reading it seemed like although it could be difficult to get a definite peanut butter flavor, many people had found success. I approached this brew with confidence from my success with my experience adding pomegranate to a saison, and opted for the higher end of the amount of peanut butter that other brewers had successfully used. However, somewhere along the line, either with the peanut butter or the cacao nibs or with my sanitation, something seems to have gone wrong. Appearance: Dark brown and opaque. If I hold it up to a light I can just barely make out the source on the other side. 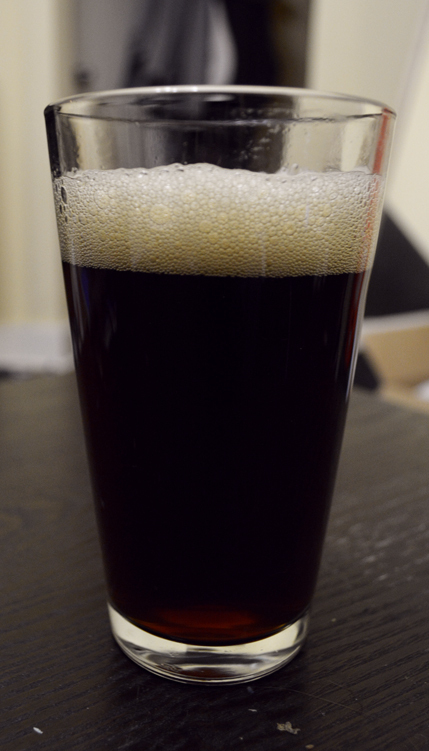 The beer forms a decent head but it dissipates after a minute leaving just a wisp around the surface of the beer. Aroma: This bottle gave off such a strong chocolate aroma that I could smell it from a few feet away. The aroma seems to vary by bottle quite a bit, as some smell only of peanut butter without any chocolate to be found. No bottle thus far has struck a balance between the aromas. Flavor: The flavor also varies by bottle. Sometimes it’s overwhelmingly strong peanut butter, but sometimes the peanut butter subdued. Any chocolate notes are usually pretty subdued. Several people have noted that there is an unwelcome tartness in the beer, which I previously couldn’t really pick up. This bottle seems to have strong acidity and a definite aftertaste that I cannot attribute to the yeast, malt, or hops. While one taster said that he finds this tartness in all chocolate beers, the acidity and flavor are more suggestive of acetic to me. It was hard to tell if the beer became infected because of the mess left by the peanut butter, but I thought I might have seen the slightest hint of a pellicle beginning before I racked the beer for bottling. Mouthfeel: Definitely over carbonated, and maybe a little thin. I don’t remember it being over carbonated the other times I’ve tried it, so it’s possible that there is some kind of uninvited microbe at work. The beer, despite feeling on the thin side, leaves the palate and tongue feeling slick. Overall: Not at all what I was hoping for. I knew this was a possibility, so fortunately at this point I’m only stuck with three gallons of the stuff, although I doubt my ability to grimace through even that much of this beer. Nonetheless, I don’t know whether to chalk up my disappointment to a bad idea or because I made a mistake that lead this brew to ruin. Given the variation from bottle to bottle, it seems like balancing the ingredients might be a bigger task than I’m eager to attack, even in the absence of a possible infection. This entry was posted in beer, learning, tasting and tagged acetobacter, cacao, chocolate, cocoa, infection, peanut butter, porter, review, vinegar, wild yeast on November 18, 2013 by Dylan Bargteil. It could be that the cocoa oils ruin the head of your beer. It certainly was the case with one of my beers when I added the cocoa powder 20 minutes before the flameout. With my last beer I added the cocoa powder in the mash, I’ll have yet to see how it turns out. I had read that since cacao nibs are just crushed beans that they still contain fats that could ruin the head of the beer, and for that reason cocoa powder might actually be a better choice (supposedly the cocoa butter has been removed from the powder). Whatever is going on with the head was the least of my concerns with this beer, though, as I can hardly drink more than a thimble of it. Other people have enjoyed it to varying degrees though, so who knows. Please share how your experiment with cocoa powder in the mash goes!